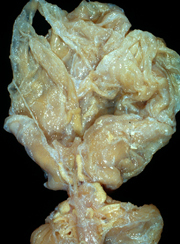 For each numbered image 1-5, select the single best lettered description or diagnosis. Each response may be used once, more than once or not at all. Total time about 8 minutes. The images are on the right of the corresponding numbers. A. 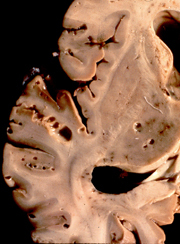 36-year-old woman with a history of remitting and exacerbating neurological symptoms. 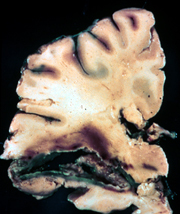 D. 60-year-old hypertensive patient with severe headache and hemorrhagic CSF. E. 3-week-old patient in NICU since birth, with beta strep sepsis and shock. History of prolonged rupture of membranes. ALL LECTURE PODCASTS ARE EMBEDDED IN THEIR RESPECTIVE NEUROPATHOLOGY PAGES AND CAN ALSO BE FOUND ON THE VIMEO CHANNEL "DIMITRI AGAMANOLIS NEUROPATHOLOGY"